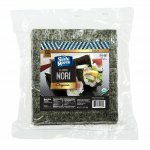 Kikkoman Soy Sauce Low Sodium Dispenser [KIKLSD] - $29.99 : SushiMaven.com, Your Source For Everything Sushi! Kikkoman Less Sodium soy sauce is brewed exactly the same way as all-purpose Kikkoman soy sauce. But after the fermentation process is complete, approximately 40% of the salt is removed. Even though there is less sodium, the flavor and quality remains the same. To maintain the full flavor, we recommend using it during the latter stage of cooking in braising sauces, soups and stews, vegetables or stir-fry. Kikkoman Low Sodium Soy Sauce's complex flavor will compliment and intensify the flavor and aroma of foods without overpowering it! Perfect for Restaurants, Office, or at Home! Ingredients: Water, Wheat, Soybeans, Salt, Lactic Acid, Sodium Benzoate, Less than 1/10 of 1% as a preservative.